There are different kinds of content writing each suited for different purposes. Know what you want to accomplish for your website and find an article writer that can deliver your needs. You should also decide if this project is going to be a one-time thing or is it ongoing. A simple website or blog update can benefit from a short-term writer, but if you’re looking to write and publish blogs at a regular schedule, you might need to look into a long-term hire. Keeping a budget is not only important when it comes to hiring SEO article writers, but for all aspects of your business. Know how much you are willing to allocate for your SEO needs and try to stick to that budget. Establish how much and how you plan to pay your new hire before the work even begins. Remember, you always get what you pay for, especially with hiring someone to do a job for you. Do some research on what the average pay for the job you need done to make sure you don’t overpay or underpay. Hiring people for output-based projects almost always have to be determined through their portfolio. Even before you speak to your potential candidates, ask to see what their portfolio looks like. Spend some time in reading through some of the samples they have written and look at it through the eyes of your readers. Are the titles they have written eye-catching? Is the content free from grammatical or spelling errors? 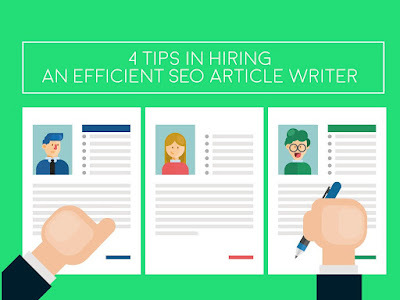 Ask your potential candidates to explain how the articles they wrote improved the SEO rankings of their clients. If your candidate contributed to the growth of their client, chances are they would be able to do the same for you. Writing SEO content deals with a great amount of research. Luckily, the internet provides most of the information the writer will need. Choosing only the relevant and reliable sources is a skill needed in order to write an informative article. Everything your writer makes should always be high quality, with correct citations and credible sources. Your candidate should also have an idea what keywords are, what kinds they use, and how they use them. Finding out their knowledge of keywords is an easy way to tell whether your writer actually has any experience in SEO. SEO content writing is an industry that attracts a large amount of talented people. Hiring an efficient SEO article writer to improve your website’s rankings requires in-depth deliberation. The prices of SEO in the Philippines worth it if you want to ensure that your business gets the traffic it deserves.